A visit to Everglades NationalPark in Florida, the largest subtropical wilderness in the country, can be overwhelming because of its sheer size and the remoteness of many trails (both water and land). But Shark Valley offers an excellent way to experience the park, especially if you like to explore on your own. Rent a bike (or bring your own) and peddle your way along a loop road through this northern section of the park. 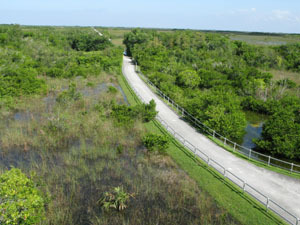 The bike trail in Shark Valley is not a difficult ride. With only slight elevation changes and no rough terrain to navigate, the scenic 15-mile paved road is ideal for bike riders of all ages. The journey typically takes about three hours, depending on how often you stop and whether a gusty head wind crops up. At the half-way point, in the heart of this unique ecosystem, the Observation Tower provides a convenient place to pause and enjoy panoramic views. To get a feel for the significance of this region, plan to ride the entire loop (if your fitness level allows), but check to be sure it’s open all the way since the curvy east portion, with expansive sawgrass prairie, is flooded and impassable at times. Alligators sunning themselves, as they lie partly on the road and partly in the marsh, provide perfect photo opportunities if you keep your distance—10-15 feet away is recommended. Raccoons, white-tailed deer, turtles, frogs, otters, and other wildlife may also appear near the road or on hiking trails. Start on the western side of the loop road, which is fairly straight, butts up against the wetlands, and hosts the greatest variety of wildlife and plants. Birds including egrets, ibises, ospreys, herons, cardinals, warblers, mockingbirds, and hawks catch your attention as they wade through marshes and then suddenly zip into the air. If you spot a bird camouflaged among the grasses and tree branches and want to take a picture, don’t hesitate: quickly snap the shutter before it flies away. Some larger species wander along the road, but they don’t linger when humans are around. Butterflies flit around the blooms, and don’t be surprised if one hovers just inches from your face. Bird watching is a popular pastime on the trail. Tiny flowers in pastel hues—white, pink, yellow, and purple--grow along the swamp’s edge. Riding with a tail wind, the road uncoils beneath your wheels with amazing speed, and mile markers printed on the road pass quickly. However, it’s not uncommon for wind gusts or summer thunderstorms to appear, especially in the afternoon, so the trip could take longer after reaching the midway point. If you decide not to ride the entire loop, retrace your path because there aren’t any shortcuts. 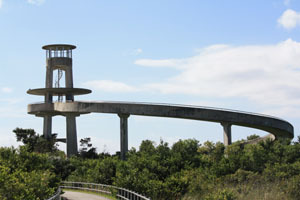 The Observation Tower offer expansive views of the surrounding area. Highlight of the ride is spectacular 360-degree views of wetlands, prairie, and trees seen from the 45-foot high Observation Tower. Views change as you walk along the elevated spiral ramp to the platform, so take time to enjoy scenes like blackbirds perched on railings cawing back and forth to each other and Monet-like reflections of clouds fluttering across the shallow, liquid meadow. Besides allowing an overview of the ecosystem, the Tower offers tranquil vistas of the Everglades up to 20 miles in all directions. Ride during cooler morning hours; take water and a light snack as there are no concessions once you leave the Visitors Center, located on Hwy 41, 46 miles from Fort Lauderdale. Tram rides are also available in Shark Valley. 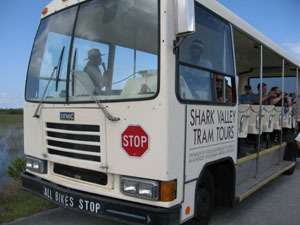 If riding a bicycle isn’t your style, the Shark Valley Tram offers a two-hour, open air tour on the same path. Trained naturalists point out wildlife and narrate information about the park. One of three entrances to the national park, Shark Valley is a significant area for sustaining the park’s biological abundance and diversity. 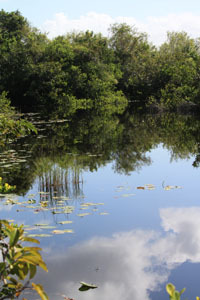 Because of its worldwide significance, Everglades National Park has been designated a World Heritage Site, International Biosphere Reserve, and Wetland of International Importance.